Time to start the discussion of our next novel from The Bestseller Code 100 list, 77. And the Mountains Echoed by Khaled Hosseini. Summary: The novel starts in 1952, when an Afghan father sells his little daughter, separating her from the brother who has raised her. It follows the waves of events that radiate out from this traumatic beginning. This is Khaled Hosseini’s third novel, published in 2013. As far as I can tell, he hasn’t published any since? A medical doctor by training, his previous novels were The Kite Runner and A Thousand Splendid Suns. 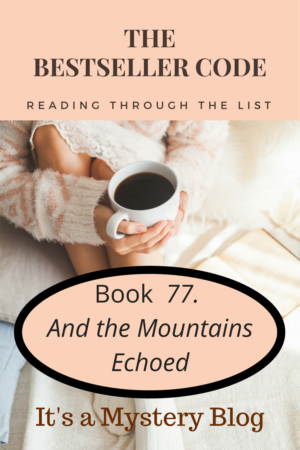 Have you read And the Mountains Echoed by Khaled Hosseini? We’d love to hear your thoughts. Have you written about And the Mountains Echoed by Khaled Hosseini? Feel free to add a link to your review in the comments.